Lena has a sixth sense for knowing when animals are in trouble. That's how she found Rawkster, a young crow with a broken wing, and Fizzy, an orphaned baby skunk. 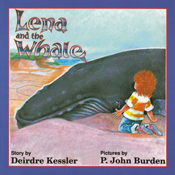 Maybe it is Lena's sixth sense that leads her to be in the right place at the right time when a baby humpback whale swims too close to the shore. But maybe it has more to do with Lena's favourite dream of being a girl who is also a whale.